Are you tired of being embarrassed to smile because you’re missing teeth? Read on to learn why a dental implant may be your best option to restore your smile. 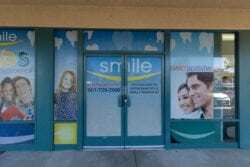 Smile Dental Group in East Lancaster CA wants to explain why more of our patients are choosing this tooth replacement option than ever before. According to tooth replacement experts, a dental implant offers people with missing teeth a permanent solution to filling in the gaps in their smile. A dental implant is the tiny titanium or zirconium post that is embedded in the jaw. Onto this post, your Smile Dental Group dentist will attach a dental crown. The crown, a false tooth created specifically to match the patient’s existing teeth, fills in the gap left by a lost tooth to restore the appearance, health, and full use of their teeth. Dental implants are highly recommended by both patients and dentists because they look, feel, and function just like your natural teeth. Dental implants may cost more than other options like dental bridges, their many benefits such as their longevity, durability and ease of care make them well worth the extra costs. While living with missing teeth can be embarrassing and uncomfortable, dental implant surgery is a mostly comfortable procedure. It is minimally invasive and leaves most patients with little or no post-procedural discomfort. For most patients, the placement process is very simple. In more complex cases where the jaw bone has degraded, it may take several months for them to have their implant placed. But people with basic missing teeth can usually get same day dental implants. To find out if a dental implant will work for you, you’ll need a dental evaluation. If you have a sufficient amount of jawbone, you can have the procedure as soon as you wish. If not, the jaw bone will need to be strengthened with bone grafts, which can increase the overall cost of dental implants. Although the cost of dental implant may be slightly higher than other options, they don’t require the regular replacement or cause dental health problems that those other options can. Once the dental implant is embedded into the jawbone, it will fuse to the bone over the next few months, ensuring that the implant is stable and secure. Once it’s fully healed, you will again have a full smile that looks, acts, and feels just like it was entirely your natural teeth. 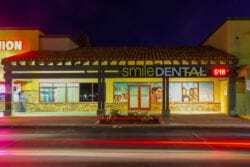 If you’re in the East Lancaster CA area and interested in seeing if dental implants can help you have the smile you really want, contact Smile Dental Group at 661.302.4416 or schedule an appointment online today!